Ok, so I did it! I got her done. I think she turned out pretty lovely. I learned a lot. And as my husband told me “you are getting better at it!” I still have to put the upholstery covering on the underneath, but that shouldn’t be too hard. But let me back up at bit. 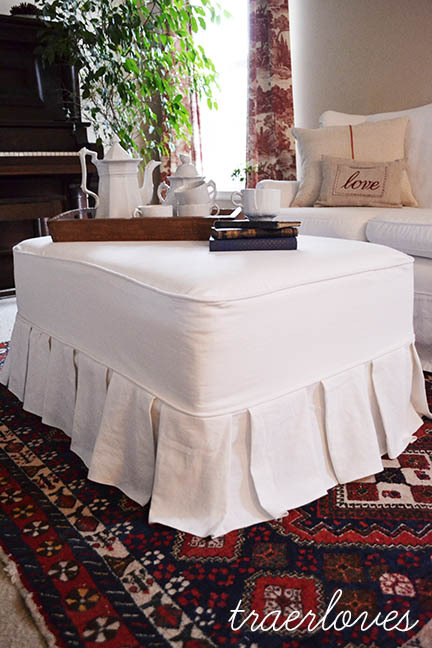 A little while back I had this idea to slipcover my current coach ottoman which is roughly the same size but has been pretty beat up over the last ten years. So then I had this idea to make one from the frame up! So I had my handy contractor guy build me a frame that matched the four inch foam I had in dimensions, which makes it so much easier to upholster when you don’t have to cut foam. I then glued the foam to the base, wrapped it in batting, upholstered over it with muslin, and then made a slipcover for her! So that sounds pretty simple, but of course there was a lot more to it than that. And to show you just what went into it I took pics of every step so you can make one yourself! Hopefully I will be able to get the tutorial done soon, probably when I am feeling better. Even though I had originally thought I would keep her, I have decided to sell her, hopefully, down in Fredrick. If she doesn’t sell I won’t be heartbroken, but I will probably list her on etsy too. Well, I really don’t feel like doing much today, maybe I will have the energy to sew some zippers in pillows, but I doubt it. I am also thinking about a Valentines giveaway too, so stay tuned for that as well. I pray you all stay healthy and have a great day! A hot cup of tea is calling my name! This entry was tagged home decor, ottoman. Bookmark the permalink. Wow! It looks amazing!!! Such a beautiful ottoman!! The ottoman looks great, but the steps sound way above my skill level.